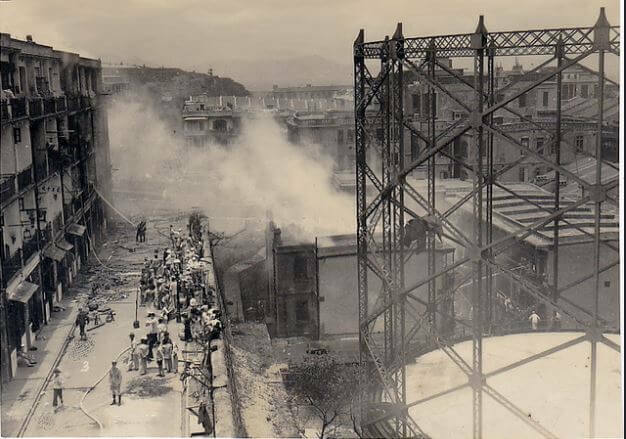 HF: “Gas Works Explosion.—At 11.05 a.m. on the morning of 14th May, 1934 a large gasometer with a capacity of 500,000 cubic feet belonging to the Hong Kong and China Gas Company, Limited, at West Point exploded, the flaming gas setting light to houses in Clarence Terrace, Chun Sing Street and Yu On Terrace. Within two hours the fire was well under control although the work of searching the debris was not completed for another twenty-four hours. In all forty-two persons were killed or died from injuries received and a large number injured. Five houses were completely gutted and eleven damaged by fire and water. This article was first posted on 27th August 2016.